Yes, this post is a few days late, but I knew that I wanted to make something interesting for Pi(e) Day. I have so many great pie pins on my Pinterest board, I couldn’t decide. I originally thought about making lemon meringue pie, as I don’t have a recipe for that on the blog yet (trust me, one is coming! ), but I handed the reins over to Paul, and asked him to pick a pie for me. He listed off about twenty different pies that he said he would like, before coming upon this recipe. He immediately stopped, and told me that he saw the picture and read the title and immediately started salivating. Well, I guess it was fate to make this pie! I found the original recipe here, and I wish I had used my really deep pie dish, because I used my regular glass pie dish and it was almost overflowing. I have a beautiful ceramic pie dish that is nice and deep, and it would have been perfect here. Making this pie didn’t take long. It’s the waiting part that takes the longest, as it has to set up in the freezer for about 2 hours. I told Paul that, and I had started it a little late in the evening, so he asked me if he could cut into it when it was done. I woke up in the morning, and sure enough, a big slice was missing because Paul had cut into it during the night because he just couldn’t wait any longer. This pie is rich and decadent, and best served with a glass of cold milk. Still, make it! It’s incredible. Hope your Pi(e) Day was as awesome as ours was! To make the pie, preheat the oven to 350°F. In a medium bowl, mix together all crust ingredients until well combined. Press into a deep dish 9-inch pie plate. Freeze for 10 minutes, then bake in the preheated oven for 8 minutes. Allow to cool completely. To make the peanut butter filling, in the bowl of a mixer fitted with the paddle attachment, combine the cream cheese and peanut butter until smooth. Add in the icing sugar and vanilla, and mix again. In a separate mixing bowl, using either a stand mixer fitted with a whisk attachment or a hand mixer, whip the heavy cream until it reaches soft peaks. Using a spatula, fold in half of the whipped cream into the peanut butter mixture until well-incorporated. Fold in the rest of the whipped cream, taking care not to beat too much air out of the mixture. Pour into cooled crust, and spread into an even layer. Keep in the refrigerator while you make the topping. Combine the chocolate and cream in a microwave safe measuring cup. Heat at 30-second intervals, stir, and repeat. I only had to heat my mixture for 1 minute total. Whisk together until a smooth ganache forms. Let stand about 5-7 minutes (in the refrigerator if you want) to thicken up a bit. Spread or pour the ganache over the peanut butter filling, and sprinkle with peanut butter cups and pretzels. Chill in the freezer for at least 2 hours. Remove from freezer about 10 minutes before serving, and slice with a knife ran under hot water. Enjoy! Warm weather means it’s rhubarb season! I didn’t actually have any fresh rhubarb on hand, but I did have a bunch of frozen rhubarb from last year. When I woke up this morning, I had the urge to bake something, and I asked Paul for his opinion. Of course, his one-word answer: pie. He is a pie fiend. Loves it more than cake. There’s a reason I’ve made him birthday pies a few times (including this year!). I was feeling pretty lazy today though as well, and didn’t want to go to the store for any ingredients, hence rhubarb pie! This beautiful pie is a combination of two different recipes (this one and this one), and a little of my own twists. Rhubarb is such a unique flavour, and so tart, and I really liked the idea of highlighting the tartness. This is such a good pie to welcome the warm months! Roll out pie crust to cover a 9 inch pie plate. Trim edges. Set aside. In a large bowl, whisk together the sugar, flour, and cinnamon. Toss in the rhubarb until well-coated. Transfer the rhubarb mixture into the prepared pie plate. Roll out the remaining crust to cover the top of the pie. Crimp edges in a decorative fashion, and cut a few slits across the top of the pie. Bake in the preheated oven for 15 minutes, then reduce oven heat to 350°F and bake for 40-45 minutes. Paul’s birthday means some kind of chocolate and peanut butter concoction. This year, he asked for Bavarian Cream Pie, and more specifically a with a Peanut Butter Bavarian Cream and a Chocolate crust. However, any recipe I found did not include peanut butter anywhere, and I looked, hard. I finally decided to use a recipe for plain Bavarian Cream pie, and then add my own spin, so I am considering this recipe an original, because I changed it (fairly) significantly. The original recipe is from this website, and I included all of my changes in the recipe below. I’m going to keep this post short, and sweet, kind of like this pie! Happy Birthday to my love, Paul! To make the crust, spray a 9 inch plate with non-stick spray. In a medium bowl, combine the chocolate cookie crumbs, sugar, and melted butter. Press evenly into the pie plate, around the bottom and up the sides. Set aside. To make the filling, whip the heavy cream in the bowl of a mixer fitted with the whisk attachment, until thick whipped cream. Transfer to a bowl, and place in the refrigerator to stay cold. In a small bowl, add the cold water and sprinkle the gelatin over the water to soften. Set aside. In a heat-proof bowl over a double boiler, whisk together the egg yolks, sugar, salt, and the milk until thickened enough to coat the back of a spoon. Mix the gelatin mixture and peanut butter into the egg yolk mixture, and whisk until smooth and well-combined. Remove from heat, and let cool until slightly thickened. In the bowl of a mixer that is completely dry, clean, and grease-free, whip the egg whites until stiff peaks, but not completely dry. Fold the whipped cream, vanilla and the whipped egg whites into the egg yolk mixture until smooth. Pour into the prepared crust. It was Pi(e) Day last week! It kind of snuck up on me, and I didn’t realize that it was Pi(e) Day until the morning of! I got home, and Paul was amazing and made dinner, so I figured I should contribute to dessert. I made this pie, and it was relatively easy to do. I just whipped up some pie crust, bought some beaches, and the crumble was extremely easy to make as well. The pie does take some time to cool down and set, and Paul and I didn’t really wait, so the first few slices looked a little lackluster. I actually waited until the pie had completely cooled and set up before I took a picture of a slice. It was a really good pie, and quite simple to make. I’m going to keep this post short and sweet (like this pie!) Go make it today! Prepare the pie crust according to the recipe. Preheat the oven to 400°F. Line a pie plate with the prepared crust. In a medium bowl, combine the peaches, brown sugar, flour, lemon juice, and cinnamon until peaches are evenly coated. Spoon the peach filling into the crust. In a small mixing bowl, combine the brown sugar, cinnamon, flour, and butter. Mix until the topping is thick and crumbly. Sprinkle over peaches. Bake for 20 minutes in the preheated oven. Turn the oven temperature down to 375°F, and bake for an additional 30-35 minutes. If the edges of the crust are starting to brown too much, put a pie shield or aluminum foil over the edges to prevent burning. Allow pie to cool completely (for at least 3 hours) until filling is completely set. Serve with vanilla ice cream. This is my first ever collaborative post! Paul helped me with this pie. He cooks dessert every once in a while, and one of his dessert specialties is pudding. 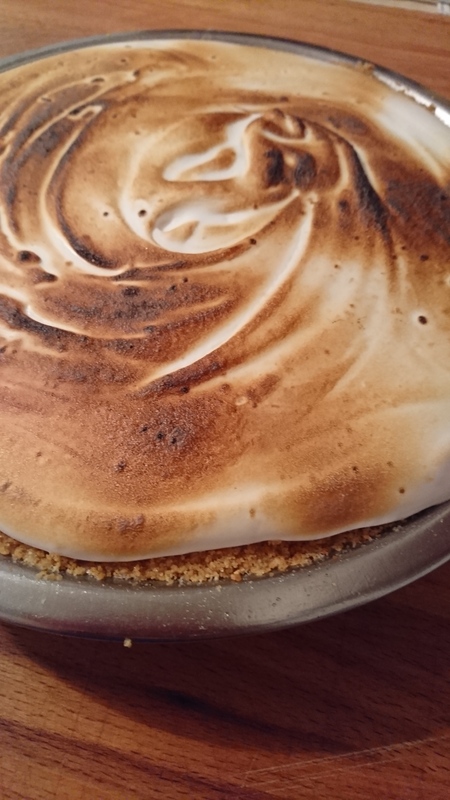 I was just hanging around the house on the weekend, and then it hit me: S’mores Pie. I don’t know where it came from, but I decided that I needed to make S’mores Pie, so this is a collaborative Sugar and Spice original recipe! Also, this is a no-bake recipe, so no turning on the oven, only the stovetop. Paul and I came up with the recipe ourselves, and it is written below. I just whipped up the crust in about five minutes, and Paul did me a huge favour and made the chocolate pudding filling, then I made the same marshmallow fluff that I used for his birthday cake. One piece of advice Paul made sure to tell me to write down is that you can’t stop stirring the pudding, or you will not get the silky consistency that you need in a good pudding. 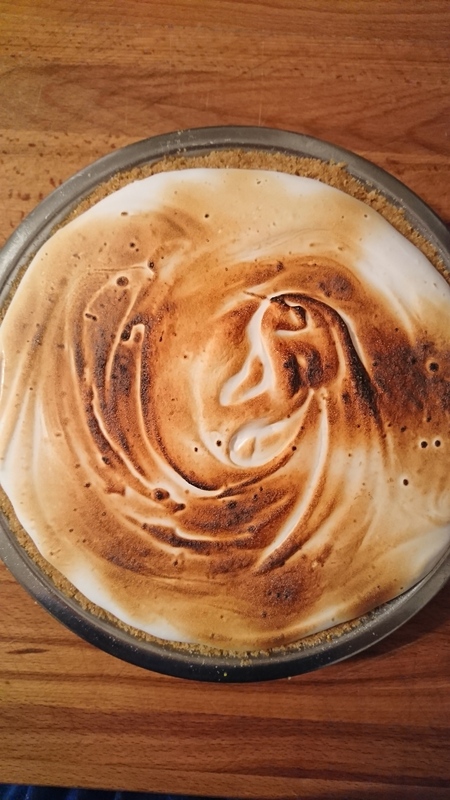 I will say that the whole, uncut pie was so easy to photograph, but it was nigh impossible to get a clean slice, because of that gooey, delicious marshmallow. If I get a good (or at least acceptable) picture of the inside of the pie, I’ll update this post. Still, the pie was totally worth it. To make the crust, combine the graham cracker crumbs, butter, and sugar in a bowl. Press into a pie plate into an even layer across the bottom and up the sides. Refrigerate until needed. To make the chocolate pudding filling, whisk together the sugar, cocoa, cornstarch, and salt thoroughly in a medium saucepan. On medium heat, slowly whisk in the beaten egg and milk. Whisk constantly (and I mean constantly! ), until boiling. Keep whisking approximately 5 minutes until the pudding is thick enough to fully coat the spoon back. Remove from heat, and whisk in the butter and vanilla. Pour into the prepared pie plate and chill completely. To make the marshmallow fluff, combine the water, sugar, and corn syrup in a saucepan with a candy thermometer attached. Whisk to combine, and heat over medium-high heat. Do not stir the mixture any more. In a completely grease-free mixer bowl with the whisk attachment, place the egg whites and cream of tartar. When the sugar syrup reaches 225° F, start whipping the egg whites to soft peaks. When the sugar syrup reaches 240° F, take it off the heat and slowly start adding it to the egg whites in a thin, steady stream. Once all of the syrup is added to the egg whites, turn the mixer to medium-high and continue whipping. Continue to whip for 7-8 minutes, or until the mixture looks stiff and glossy. Add the vanilla and whip until the fluff has cooled. Top the chocolate pudding filling with the marshmallow topping, and toast with a kitchen torch. Chill pie completely, then slice and serve.